As we mentioned last month, the market is changing a little, but listings are still moving and selling for high prices in general. Interest rates came down again so that spurred some new activity in the market. Right now we’re noticing that different neighborhoods are getting different reactions depending on their location, condition, and their price point. Something that we’ve also been noticing is the fact that home sales are going down, while inventory is slowly growing. 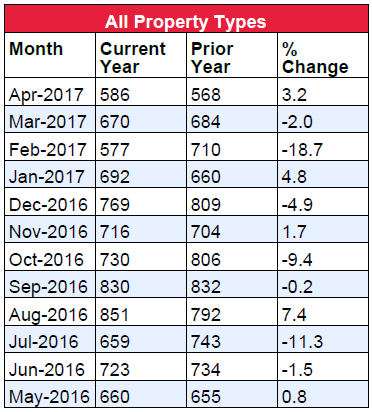 Since January of this year, inventory has increased every month, and closed sales have been consistently below year ago levels. While one would think that this is due to new inventory hitting the market, our opinion is that there are more listings sitting on the market and(or) not selling. In other words, if listings are staying on the market longer or aren’t selling, and home sales are going down, then that results in a net increase of housing inventory (i.e. More Supply and less Demand). Currently month’s supply in Queens is at 5.4 months. This is higher than April’s 5.1 months, which was higher than March’s 4.9 months, which was higher than February’s 4.3 months, which was the same as January’s 4.3 months. Month’s supply is the number that measures supply and demand in our industry, and the fact that it has been slowly rising every month this year is very interesting. Rule of thumb is month’s supply over 6 months = Buyer’s Market, Under 6 months = Seller’s Market, and 5-6 months = Balanced Market. So, as you can see we are still in a seller’s market, however, it does seem to be balancing out a bit. It will be interesting to see where it goes during the next few months and throughout the year. In our opinion, it will most likely continue to feel like a seller’s market until month’s supply reaches 7-8 months. 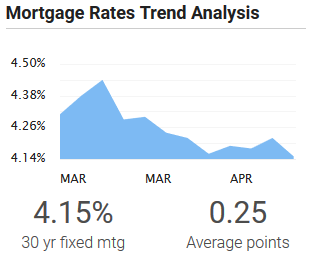 Mortgage rates decreased this week. The benchmark 30-year fixed-rate mortgage fell 7 basis points to 4.15 percent. The 15-year fixed-rate mortgage fell 9 basis points to 3.35 percent. The Long Island Board of REALTORS® reported 586 home sales during the month of April. This was a decrease of 12.5% percent from March, but an increase of 3.2 percent from April of last year. Something important to note is the fact that the rate of sales (i.e. avg homes sold per month) has been decreasing every month this year. What that means is that home sales are declining, and when you couple that with the fact that inventory is slowly growing this year, it signals a shift in market dynamics. Specifically, Residential 1-3 family Queens home sales were DOWN about 5.6%, Queens Condo sales were UP 4.8%, and Queens Coop sales were UP 8.6% compared to this time last year. Over the last 12 months, Queens home sales are DOWN 2.7%. 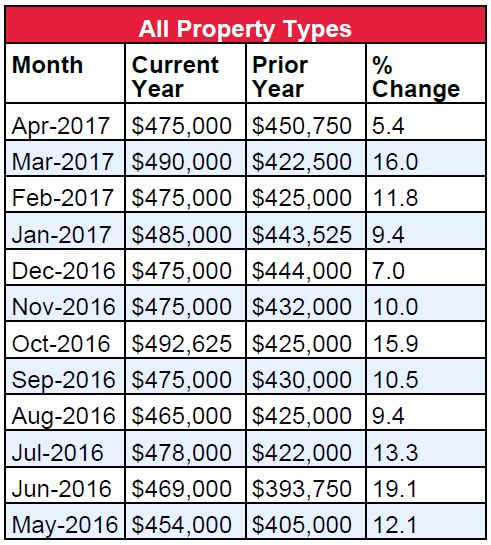 The Long Island Board of REALTORS® reported a median Queens home price of $475,000 in April, this was DOWN 3.1% from March and UP 5.4% from April of last year. April’s median home price marked the lowest year over year increase in more than one year. Specifically, Residential 1-3 family Queens home prices were UP 7.9%, Queens Condo prices were UP 1.1%, and Queens Coop prices were UP 18.3% compared to this time last year. Over the last 12 months, Queens home prices are UP 11.2%. 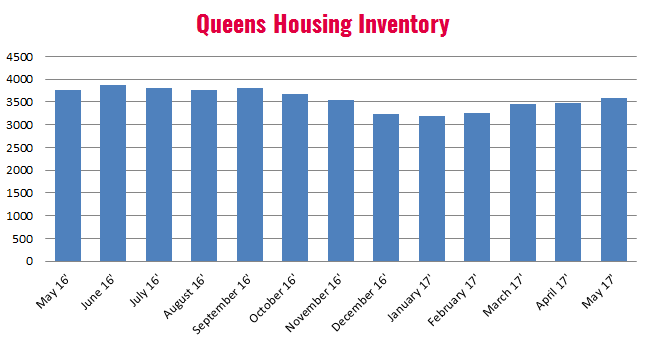 There is currently a 5.4-month supply of housing inventory in Queens, this is up from the 5.1 month supply that we had last month and the 4.9 month supply we had in March. Month’s Supply is the figure that measures supply and demand in real estate. Month’s supply over 6 months is said to be a buyer’s market, month’s supply below 6 month’s is said to be a seller’s market, and month’s supply of 6 months is said to be a balanced market. The total number of homes for sale increased by 2.8% compared to last month, and more importantly, inventory has been slowly growing every month this year. In my opinion, this is not a result of new homes for sale, as much as it is a result of homes sitting on the market longer and(or) not selling. The fact that month’s supply is increasing every month this year is very significant. It will be good to monitor this number because once it hits 7-8 months, we will likely see a shift in prices and(or) days on market. Specifically, there are currently 2,422 residential 1-3 family homes for sale, 355 Condos for sale, and 801 Coops for sale in Queens county. Total: 3,584 Queens homes for sale.